These unbelievably smooth gel sticks glide on paper like magic! They lay down color easily and blend just as easily to create new colors. 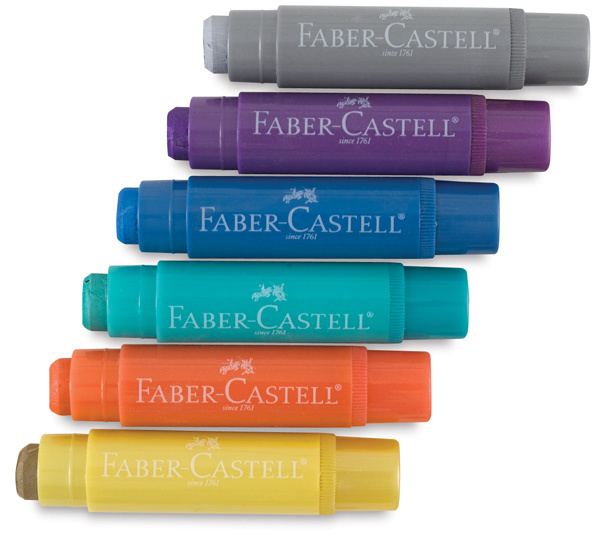 What’s more, because Faber-Castell Gel Sticks are watersoluble, they can be worked over with a paintbrush or spritzer to achieve beautiful watercolor effects. These metallic colors are great for creating special effects on dark paper. Or combine them with the original Gel Sticks to create glittering new colors! The set includes one each of Metallic Gold, Metallic Red, Metallic Green, Metallic Blue, Metallic Purple, and Metallic Silver.